Weird Jukebox for your iPod or iPhone | OhGizmo! By Shane_McGlaun on 08/31/07 • Leave a comment! If you are the old school type that likes to have new gadgets and need a way to mix old and new, Advance Sound Devices has a strange product that might do just that. 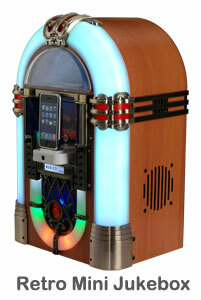 The device is called the Retro Tune Mini Jukebox and is basically just what the name describes. You get a mini jukebox with all the style of the 50’s down to the rotating light column coupled with a dock for your iPod or iPhone. The dock allows you to charge and play your iPhone or iPod while viewing the screen. Other features of the jukebox include an alarm clock that can wake you to music from your iPod or iPhone and a single disk CD player. The device also includes a remote that allows you to control your iPod or iPhone from across the room.